Take note of my penchant for tacky. This is one of my fav shots. I use it on my computer desktop. It makes me smile. Yeah, it's purple. Purple is pretty much my hands-down choice for eye colour. If I could afford them (and tolerate the notion of sticking something in my eye) I'd wear purple contact lenses every day—well, every day that I wasn't wearing stark white or absolute black or little skulls…I should probably seek help. The photo has, of course, been manipulated. I've often wondered if people think that makes it less (less photographic, less real, less honest, less worthy) or overdone. It certainly could have been more subtly approached. And I considered that, but there's nothing terribly subtle about purple eyes in the first place. There's no reason to hold back any of the boldness that the Photoshop tinkering produced. This is fantasy and it's okay for it to be loud and thick and highly contrasted. It's okay to be over the top, outrageous and grand. It's the royal eye, after all, and We are very happy with it. 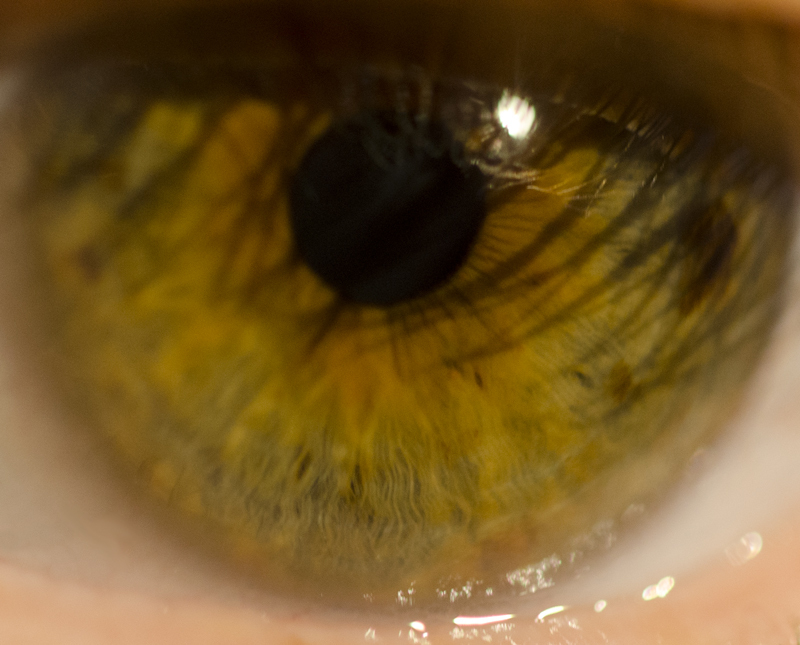 For the record, the original pic, which I also happen to like, is the end result of pretty near blinding myself the day I first bought my macro lens. When I look at it, I feel a little smart in my ocular nerve. You know, I used to have brown eyes. 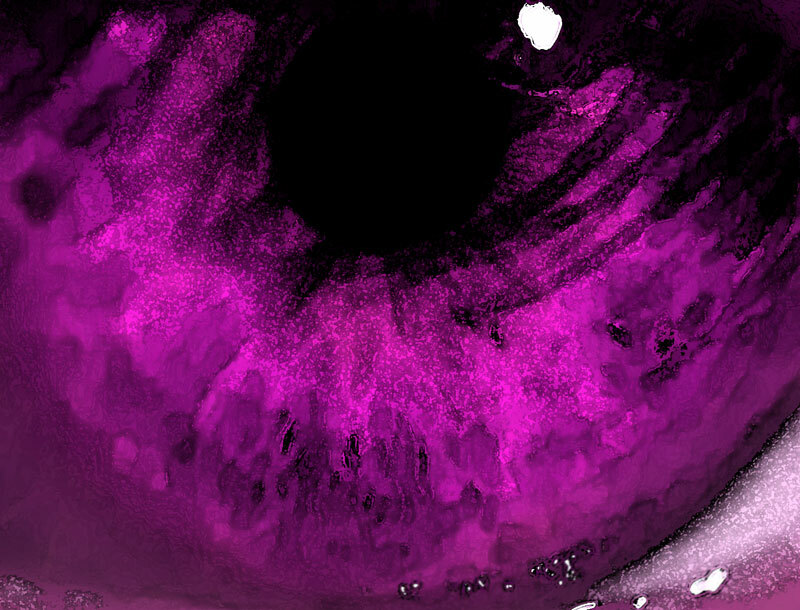 When Minsis went into the hospital to have Naskiau, she was wearing purple contacts and the doctor kept calling her the purple eyed woman. Liz Taylor had violet eyes so why not purple?! My eyes used to be brown too. it's amazing how much our eyes change over our lives. InstaMom & The Soft Pitch. Life might be short, but I am determined it will be wide. I am very interested in things that are very different from each other. This is the clearest explanation I can give for the diversity in my work. I am as passionate about photography as I am about writing, as excited about graveyards as mechanical functions. I have written legal briefs, technical briefs and comic books, and I’m proud of the work done in each project. Throughout almost everything I do is an underlying appreciation for structure. I am interested in the bones—sometimes literal, sometimes figurative—how they hold up and work together to make something larger sustain itself. I think my favourite part of the creative process is the labour itself, the building and shaping of the piece. I am very excited to be learning the art and process behind graphic design. I’ve been exploring new avenues of expression that will enhance my ongoing projects and spur me on into yet unknown waters.